It has been a busy past few months in which I have done more growing, experimenting, and learning. So here is some pieces from this spring semester. This is a video I did for my image, text, and sound class that is part of the photo minor I am attempting to complete. It is just playing with a bit of traditional animation I tried out for the 1st time using a character I had doodled up one day. Another video from this class will be posted once a bit of editing is done. 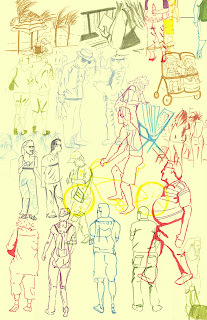 This is just some drawings done for an illustration project illustrating on an event in Miami Beach, FL. There will be more spring semester work coming soon using a technique I am currently trying to develop and I'm excited to see where it takes me.